Random Threads # 18, saving, keeping, treasuring, hoarding? 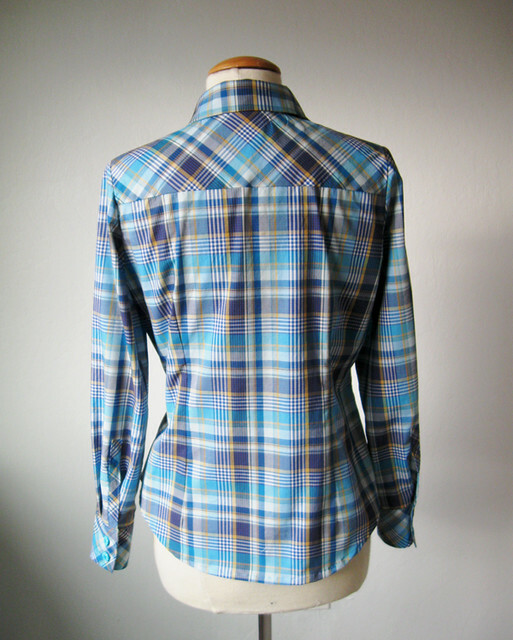 Still an extravaganza of shirt sewing going on here, this latest one using the same pattern (why change a good thing) but this version is silk crepe de chine, in a lovely teal green color. I am trying to sew with perfection as this is the type of thing that stays in my wardrobe for ages, a solid color silk blouse is such a great item. Also I am doing the hidden buttonhole placket down the front - so stay tuned in the near future for a comprehensive post on how to do that. But today's title is Random Threads - so here are a few of my random topic notes. And keep reading if you like 50's vintage - a peek at one of my treasures lower down in the post. Hemming RTW jeans - are you like me and need to lop off a good 3 to 8 inches depending on the style? I always wonder who they are made for and then I talk with taller friends who complain about too-short RTW jeans. Something for everyone (to be bothered by). I have a process which might seem a bit convoluted but you know, shrinkage, ha. Anyway I usually wash jeans immediately, and let them hang dry, then press and try them on with various heel heights, decided on a hem length. and then just tack the hem well enough so it stays but can't be seen on the right side. You can see here that the hem allowance is tacked to the side seams and just a bit in center front and back. So I wear them this way for a while - a good while, and decide if I like the length. I might wash again to see if they shrink any more. Jeans always seem to shrink in length not circumference, right? Sometimes wearing them this way even starts to make that wear line right at the edge. which is the beauty of the second shrink - then I lengthen them about a half inch, hem and machine stitch over any wear line. Does this sound like a lot of trouble? Possibly but I hate it when I have jeans just right and then they come through the wash a good bit shorter. Also - the duct tape hem. Or packing tape, or any tape at hand. I have done that a LOT! In college, traveling in Europe, new jeans plus a roll of tape and a few minutes of focus and you are good to go. Using whatever is at hand for a measuring device. Folded paper works perfectly! So this week I just hemmed these jeans which are a year old. 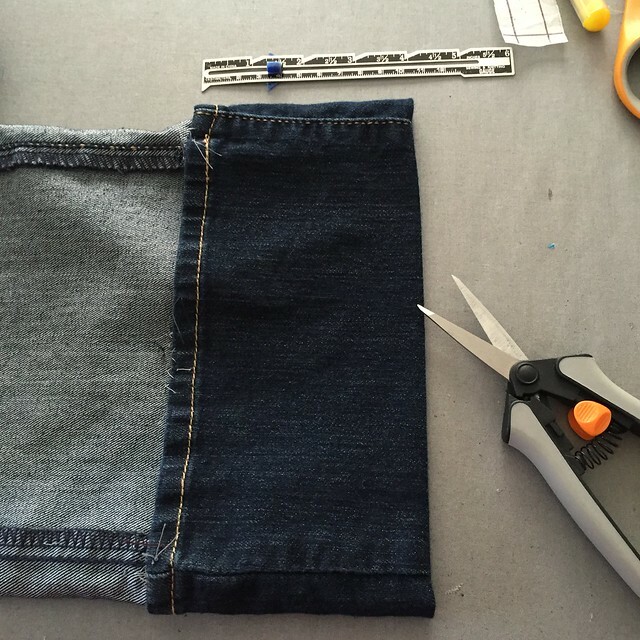 Decided the length was OK so time to hem :) I still have no interest in sewing regular denim jeans despite getting very close to a good fit on my Bootstrap Pattern jeans I showed in my previous post, but I do want to sew some other types of pants. I have had a craving for some "crazy pants" i.e. some wild print pants in a casual cotton to wear in the spring. So that might happen. Do you keep scraps? Paper, fabric, vegetables? Turning to my desk I find plenty of paper scraps with various topics scrawled on then. I have some nice notebooks and always have the idea to keep all my sewing notes in one, but I am a scrap paper saver thus they are always at hand. Are you a paper saver? It seems a shame to waste big gobs of blank paper that come in the mail, all sorts of stupid things, bills that have "this page intentionally blank". What idiot came up with that one? So wasteful. But on my desk, at the kitchen counter, even a few in my car, scraps of paper for lists. Consequently I will claim that I am not a hoarder but I hate to throw out things that are still useful or potentially so. It seems so wasteful. I have mentioned before but I come from a long line of string savers (didn't you have a grandma that saved string or a dad with cans of assorted nails, screws and other fasteners tucked away on the workbench?) 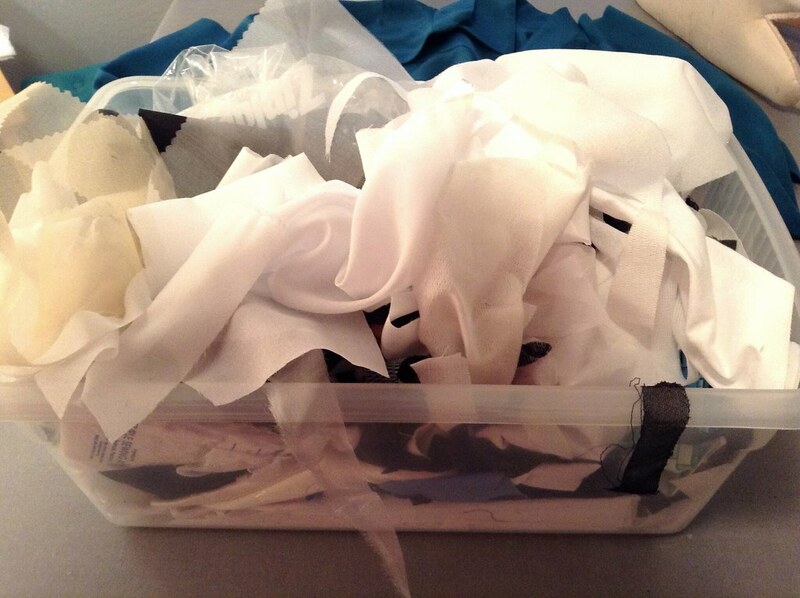 Here is my small bin of interfacing scraps. They get used for things like stabilizing hems or testing interfacing choices. In my last Random Threads I briefly mentioned the idea of "Tidying Up" by that I meant the Marie Kondo method which is so popular. Having not read the book I only have a passing idea about it but the overarching theme of minimalism is not my style. And there are things in my house that are not sparking joy but are completely useful - even if only at certain times. I can deal with most things but the category that is a conundrum is the meaningful, sentimental or beautiful but useless item. Do you keep or not? I have some things that I just can't get rid of. Here are a few. I bought these shoes the first time I was in Paris, at the end of a long trip that took me through Italy and onward to France. By the time I got there I had bought 6 pairs of shoes/boots and other assorted leather goods. But then I saw these and they came home as well. 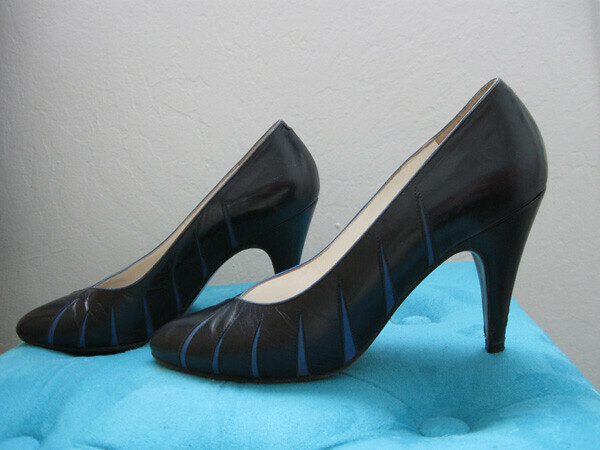 I did wear them a lot, but now they are about one size too small plus those heels and my back issues don't mix. But they are so pretty! So I keep them. And now please don't laugh! Yes these are the original Calvin's. I seem to recall they were dark blue when I first bought them so obviously well used. Hey, teenage me thought they were utterly cool. Saving the best for last, this is a cocktail dress from the late 1950's that belonged to my mother but which I adopted (stole from her extra closet) ages ago and have worn to so many parties. I know I have said many times that I rarely wear black but there is something about this dress that makes it one of the very best dresses I have worn. I lightened the picture so you can see the detail but it is inky black. I think it looks good on the dress form but on the body it transforms to the ultimate va va voom vintage style - very 50's movie star. 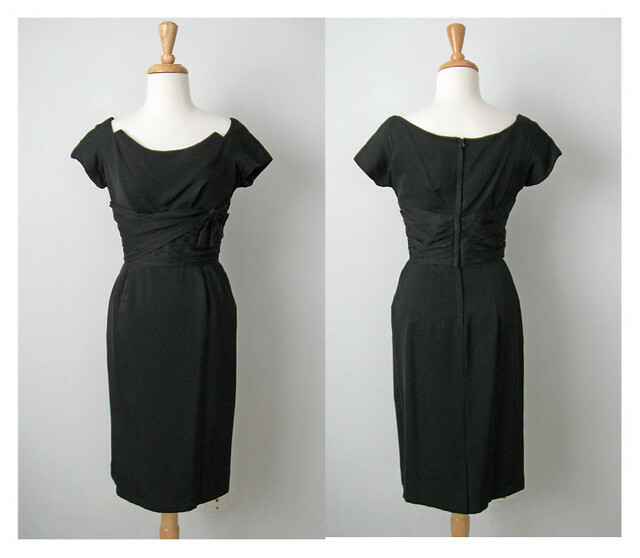 The dress is a black crepe and then the section at the waist is draped with chiffon, even a little bow. It is fitted but not tight, curvy in all the right places. The pleats in the bodice emphasize the bust and those little corners on the neckline just add some zing. 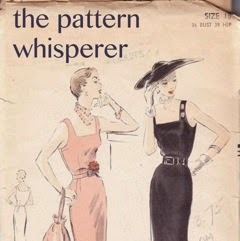 I love, love, love this dress and have often thought about making a pattern from it to copy. One of these days. And yet there is always something new to sew. I think that is the issue with making things, unless you give away or sell then you end up with stuff. Clothing is useful but at some point you have enough clothing, however I like to sew for the challenge, it is just something I enjoy doing and so I will continue although I should try to purge more things that are never worn. 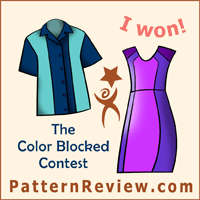 Next random topic: Colette patterns. 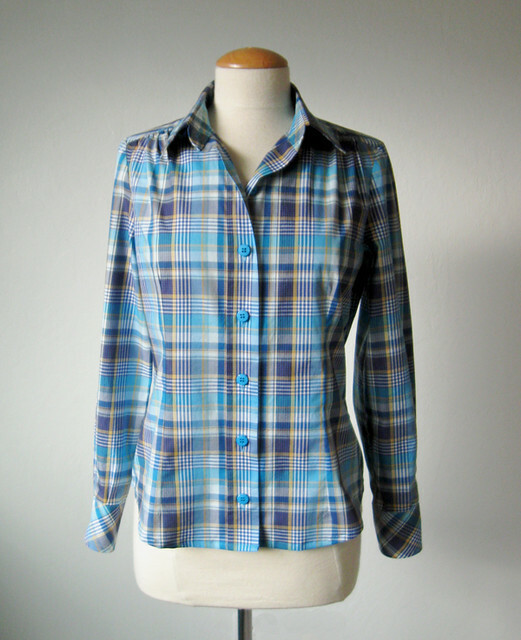 I am completely an outside observer when it comes to most of the independent pattern companies. As I have mentioned before I am not their target market which I think is now more geared to people beginning with sewing. Analyzing their business moves of late they are probably smart to try to diversify, creating an on-line magazine, changing the style of their patterns from a vintage-inspired to a more modern and simple look. But whew - I think their patterns are mostly blah - with a dash of sad and shapeless. If you are going to the trouble to create an online magazine with high quality photos then the examples shown should be stellar - and theirs seem to be barely adequate. Some of the things they show are really poorly done or have a terrible fit. I don't think it is deceptive to show a perfect version as the example, I want to see the way it should look. On another note about independent pattern companies, I just received the latest email newsletter from Stone Mountain Fabrics and Suzan the owner mentioned that they would no longer be stocking Vogue/New Look etc. based on the pricing and what they are sold for in the big chain stores it was financially untenable for them. I completely see her point and if I do buy an indie pattern I try to buy it there at the store. Let's talk about feet. Sewing machine feet. My various sewing machines have all kinds of different feet and yet I almost never change them. Including several different walking feet or ones with rollers etc. Just have not needed to do so and truthfully I forget they are even in the drawer. I would probably be happy with a straight-stitch only industrial machine. The machines for a home sewer that are made for a variety of stitches have that throat plate with the horizontal opening for the zig-zag and that thing seems made to swallow delicate fabrics. Which is why I will keep my old Singers humming along forever. But back to feet. Do you use this one - the open toe foot? Whew these things have funny names when you stop to think about it. But sometimes, particularly at night I find it impossible to see the stitching due to the plastic/metal pieces in the center of the regular foot. The open toe foot is better for seeing where the needle is going. But not as good at feeding the fabric along. I do tend to use it for really precise sewing, like on a collar edge where I want to be absolutely sure I am following the stitch line. Usually after I have messed up something, had to pick out the stitches and am ready for round 2. The future of sewing is in good hands: I direct you to this blog: anelisemadeit.blogspot.com. I'm not sure where I came across her blog but she was still in high school when I first read it. Now she is at MIT, still sewing and pursuing all kinds of interesting things, including academics :) And finding time to go to Boston Fashion week! I love her tag line "it's not bragging if you made it". Totally agree! Check this out, she made the Ralph Rucci Vogue pattern coat, in winter white. Fantastic. So another brainy stitcher to keep your eyes on. I didn't even get to some of my other random topic scrawls, such as exposed zippers which I just don't get. What is the point? I find them jarring and they rarely add interest. Probably just me as their popularity doesn't seem to wane. This one falls in the category of to each her own. Actually I'm not much of a zipper fan in general, as a design element so actively avoid patterns that have a zipper for things other than closure. 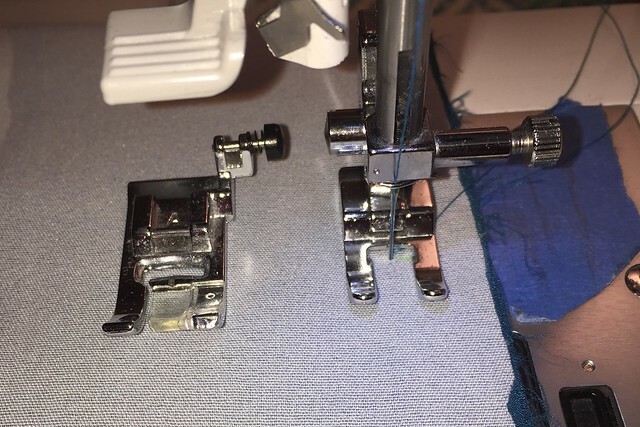 Personal sewing quirk - we all have them. What is yours? Enough random thoughts for today - as usual I need to get outside and pull some weeds while the ground is still soft from the January rain. 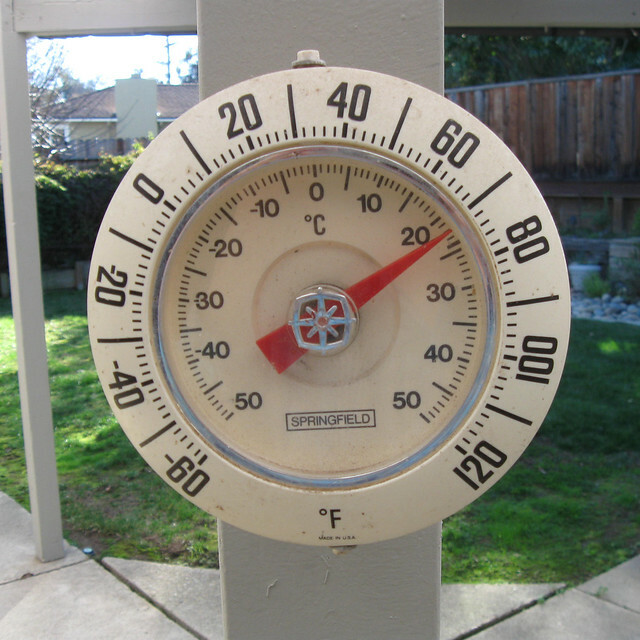 February has been dry and today it is supposed to be 75˚F. What? (my apologies to those of you in the eastern deep freeze) Oh well, it's a nice long weekend so we are enjoying it. Now off to Home Depot to buy mulch. What an exciting day, right? 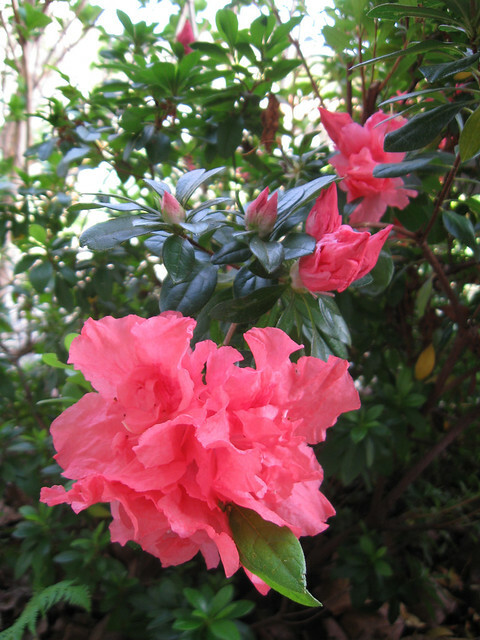 a pink azalea that lives near the front door. That title pretty much encapsulates my sewing of late. 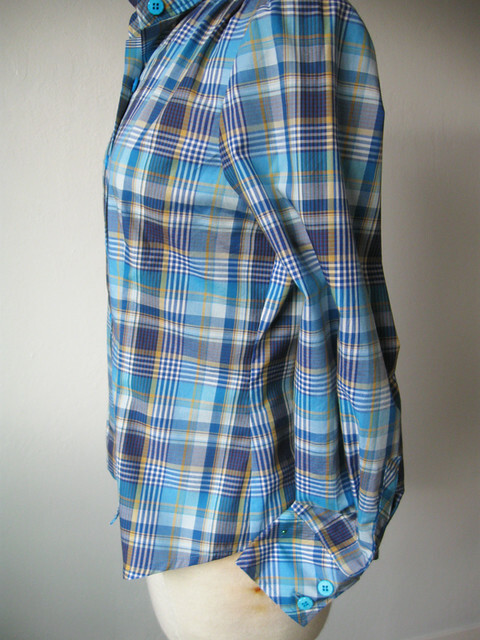 I don't know why I am making so many shirts lately, although a shirt is a reasonably quick item to sew. And very satisfying to do all that precise work. I have this Simplicity pattern adjusted to perfection (S2339). Plus I have a file folder filled with alternate pattern pieces, to rotate the darts into gathers, or choose from various buttonhole plackets. This might be the closest I have ever come to creating a TNT pattern. While I have made some dress patterns and a few skirts over and over, this is the one pattern that I would reliably use to design something new. 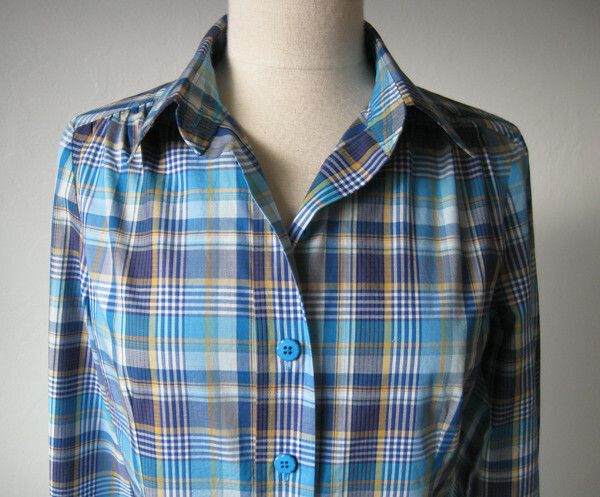 I have a yearning for a shirtdress for spring, and even bought the famous McCalls shirtdress pattern (MC 6696) however the other day the idea popped into my head to just use this shirt pattern and create a skirt. Hmmm. 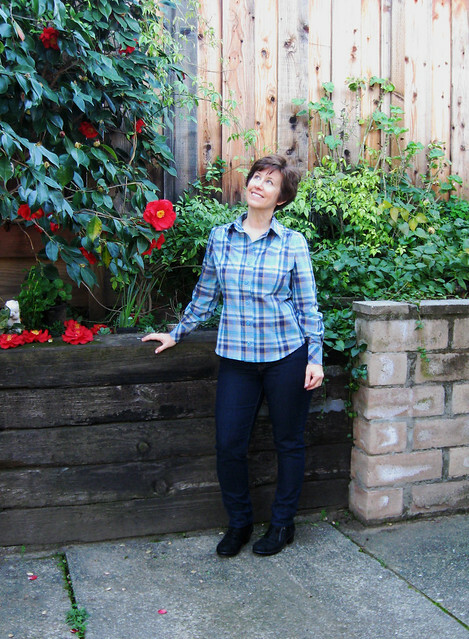 So shirt details first and then the Bootstrap jeans custom size pattern details. Back to this new shirt. Since it is plaid I decided to use my version where the horizontal bust darts are converted into shoulder gathers. Here's a link to a shirt with that detail, and here's a link to a post I did on Craftsy showing how to convert the dart to gathers. This is one of the few fabrics that I have ever purchased at Fabrix in San Francisco on Clement St. When I lived in the city I would stop in there once in while but now I rarely go to this store. I think Shams finds some treasures there periodically. It's one of those places that are hit or miss but lots of bargains. Although the parking in that neighborhood is insanely difficult. So it has been marinating on my fabric rack for a while - maybe 4-5 years. Which is unusual as I don't keep stuff all that long but it finally made it onto my cutting table. The main reason I decided to use the shoulder gathers instead of the dart is for the plaid matching. Which worked a treat and I'm quite satisfied if I do say so myself :) No pesky bust dart to throw off the side seam matching, thus the sleeves are matched too. Score! That is a scorch mark on the side of my dress form (another garage sale purchase) I think it got too close to someone's wall heater in its previous life. What am I looking at? Bees! so many honeybees already in the garden. Swarming all over this camellia. Which is the only one of its type in my garden, so sticky with nectar that the bees love it. And of course in most all the pictures my front button alignment is off a teensy bit. Oh that makes me crazy. But here it looks OK. The buttons were also in my button box. 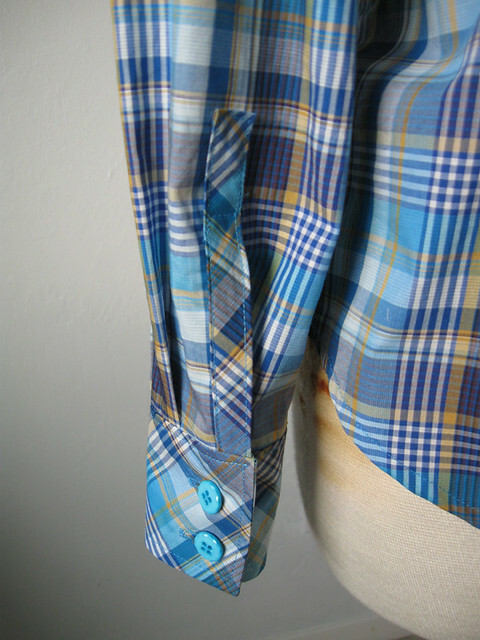 I don't think I would have picked these particular ones out if I had been in the store choosing buttons for this shirt, but I had plenty, enough for shirt front and cuffs so it seemed like a good reuse. A few touches of bias. 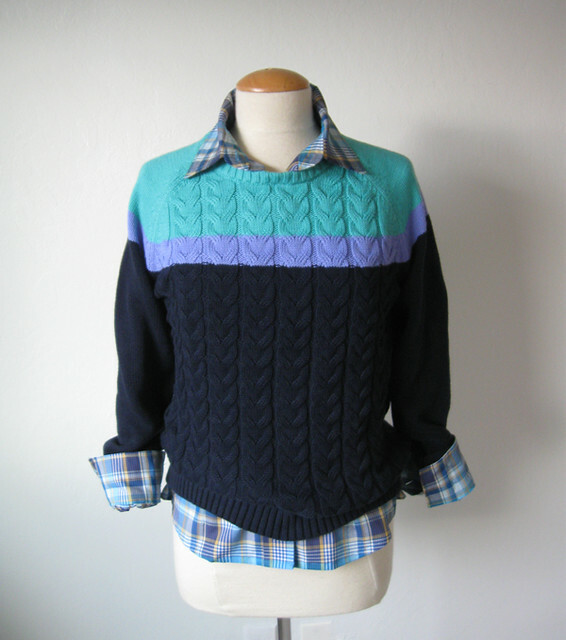 I received this sweater as a Christmas gift, so that is mostly what prompted me to use this fabric for a shirt. Also why I tend to make shirtsleeves a bit on the long side, so I can flip up the cuffs when I am wearing a long sleeve sweater, just a habit. The colors are not exactly the same, but I think complementary. So far I have not worn either piece despite finishing about two weeks ago - maybe tomorrow. 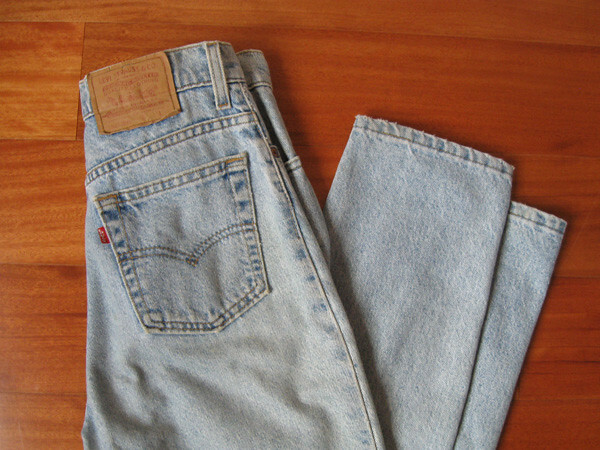 Now for the Bootstrap Fashion Patterns jeans adventure. To sum up the experience - I am impressed! I have sewed a Bootstrap Fashion pattern previously, a dress and the fit was very good. And since pants are my achilles heel of fitting - I figured why not try their new custom jeans pattern? Actually I am not at all interested in making jeans per se. I have lots of ready-to-wear jeans and I just find it way easier to buy them than to source the just right denim - do all that topstitching - tweak the fit etc. So jeans sewing - a phrase that my grandmother used to use comes to mind - I just can't be bothered. 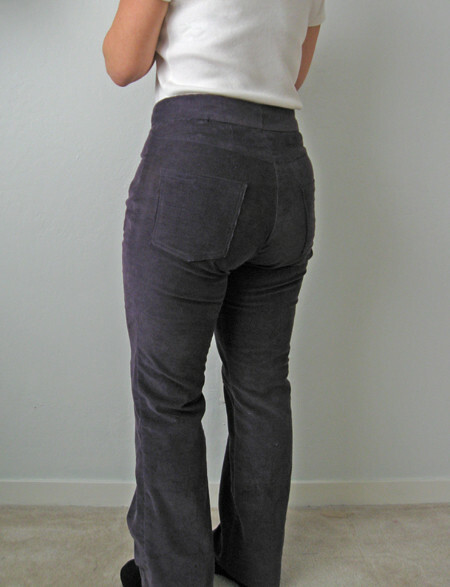 But pants in general - those I would like to sew more often. And a well fitting jeans pattern I could use to make pants in other fabrics, like cotton sateen for summer or corduroy for winter. 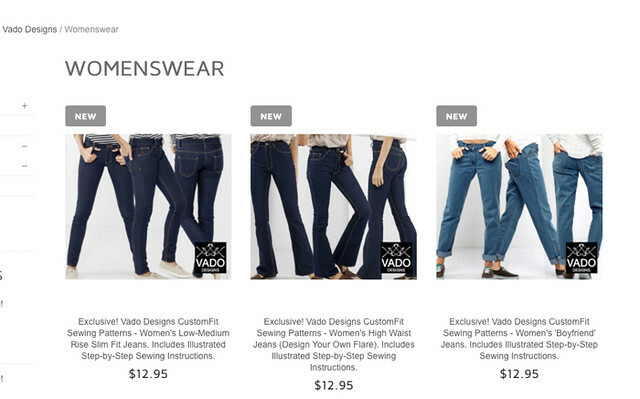 On Bootstrap there are 3 different custom jeans patterns, listed in their Indie designer section. All by the same designer Vado, she created a skinny jeans pattern, an at-waist bootcut pattern and a loose boyfriend jeans style. Skinny jeans are super cute on lots of people but I just never feel right in them - and having a very long rise a higher waist jean usually fits better so I picked that one. 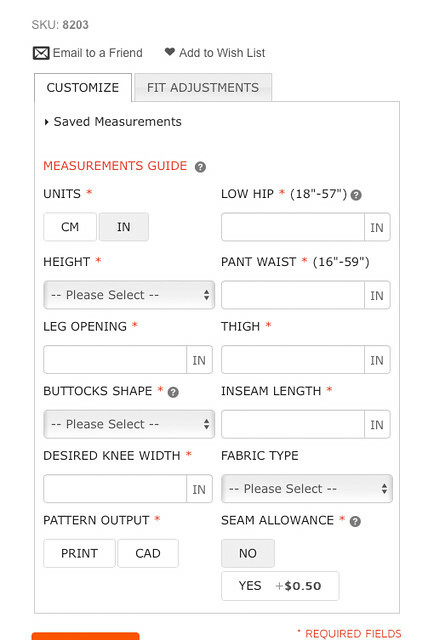 As usual with Bootstrap patterns you enter your measurements for a custom fit. I was pretty exact with my measurements as I wanted to see how they came out, what kind of ease etc was designed in the pattern. For the knee width I used the measurements from an existing pair of jeans that I have, also the leg opening (which is the bottom hem opening). Thinking about it later you could change those to obtain straight leg or any other variation. Much like their other patterns where you can choose belly shape (which I like to categorize as choosing anywhere between flat-abs up to 2nd trimester) on the jeans pattern it's not belly shape but you can indicate the shape of your bum. Useful! I picked average but for next time I might choose curvy. The other change I will make next time (oh yeah, there will be a next time) is to increase the waist measurement entry. My waist is rather high, so my smallest natural waist point is probably 2 inches higher than where the top of the pants landed. I think if I add about 2 or 3 inches then the fit will be better around that spot and I can always take them in if needed. Now for the result. I chose no-stretch for this version as I had a piece of 100% cotton corduroy to use for the test. Also I thought a non-stretch fabric would be a better indicator of fit. You can select fabric type, no stretch or various %'s of stretch which is clever. Not bad huh? The part that really amazed me was that the knee was in the right place, the length was correct, the back rise was just about right and the fit around the thighs felt like ready to wear jeans. In the interest of science - sewing science :) I am putting these fairly awkward photos of my rear view up here. You can see the waist is a bit tight but in the right spot. I think the pockets are a bit oversized and low, I don't like jeans pockets to be at all on the thigh but that is easily changed. I left off the belt loops for this test version. Although maybe I will leave them off future versions depending on the fabric. On the other hand I wear belts a lot. 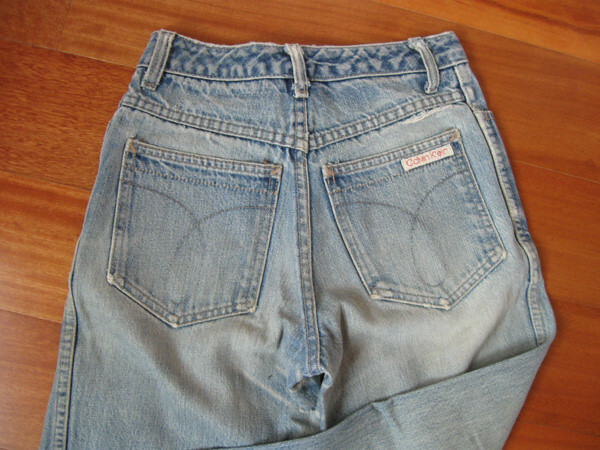 Buying jeans/pants to fit my bum means the waist is so often too big. Perhaps it's time to fix that. In the front rise I think there is a bit too much length, generally pants that fit me best have a lower front and then are higher at the back waist. Also I think I used a too long zipper which messes up the front a bit. These were not ever gonna be real pants (something I would wear out of the house) but I figured maybe usable, but then I went and cut a hole in the front under the zipper. So no, not wearable now. That's the scoop on my Bootstrap fashion jeans experiment. Getting very near success. I think I will try another pattern, with the changes I noted about and also use a 1% or 2% stretch fabric. Because walking around in those corduroy pants made me realize how much I love a little bit of lycra. Earlier this week I started another silk blouse - a version with the hidden buttonhole placket as several people left comments on my previous post that they would like to see how to do it. That will be coming up soon and it gave me an idea for a Craftsy post as well. (lately I am coming up blank on topics for my Craftsy blog posts - any suggestions would be welcome :) Do you read the Craftsy sewing blog? Some interesting stuff there. Where I have really learned some nice tips and tricks are by reading their other blog subcategories - cooking, gardening, photography are the ones I find useful. So Super Bowl Sunday is just about over - despite having zero interest in either team it's fun to watch especially since it was here in the bay area. It has been madness all week. The city was crazy! Also this happened today. Yep, spring is here. Although we are seriously hoping for more - more - more rain. My new roses need it!